writers compose. 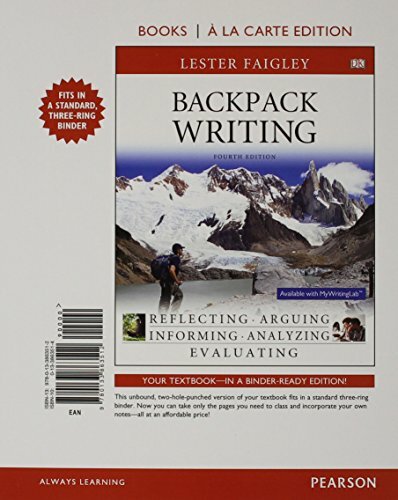 One of the first textbook authors to focus on multimedia composing, Lester Faigley employs his own advice to engage students in every step of the writing process-for both college composition and everyday life-and pulls back the curtain on how writers work.Aligned with the learning goals for a first-year college writing course identified in the 2014 Outcomes Statement from the Council of Writing Program Administrators, Writing: A Guide for College and Beyond gives students the support they need to succeed in first-year composition, in their other courses, and in their careers. In the Fourth Edition, students can also practice and explore what they've learned chapter-by-chapter with interactive MyWritingLab tools, assignments and projects. Also available with MyWritingLab(tm)This text is also available with MyWritingLab(tm) - an online homework, tutorial, and assessment program designed to work with this text to engage students and improve results. Within its structured environment, students practice what they learn, test their understanding, and pursue a personalized study plan that helps them better absorb course material and understand difficult concepts.